Originally a member of the Zofian army, but when the pirate Barth slaughtered his family, he vowed to get revenge. While he was waiting for his chance, Celica’s group began a fight with the pirates, and they joined forces to take down Barth. Valbar felt a debt of gratitude towards Celica for having helped him fulfill his revenge, and sets out on her journey with her. With his big heart and carefree demeanor, he’s good at taking care of others, and his companion in the army, Leon, holds a special affection for him. Afterwards, he was given the role of training new recruits to the unified knight squadron, thanks to his personality, and happily spent his later years surrounded by many people. A mercenary from a distant land, he was employed as Valbar’s teammate. Along with him, he ended up newly employed in Celica’s army. Placid and easygoing, he’s a man who hates commitments and enjoys freedom. He previously lived a nomadic life, but because his clan was defeated in a conflict, they were forced to settle. Unable to adjust to this lifestyle, Kamui set out on a journey. His swordsmanship has become honed due to his wanderings, but he’s still no good with Necrodragons. Although he mentioned possibly giving up the blade partway through the journey, it seems the wanderlust in his blood wouldn’t settle for that. 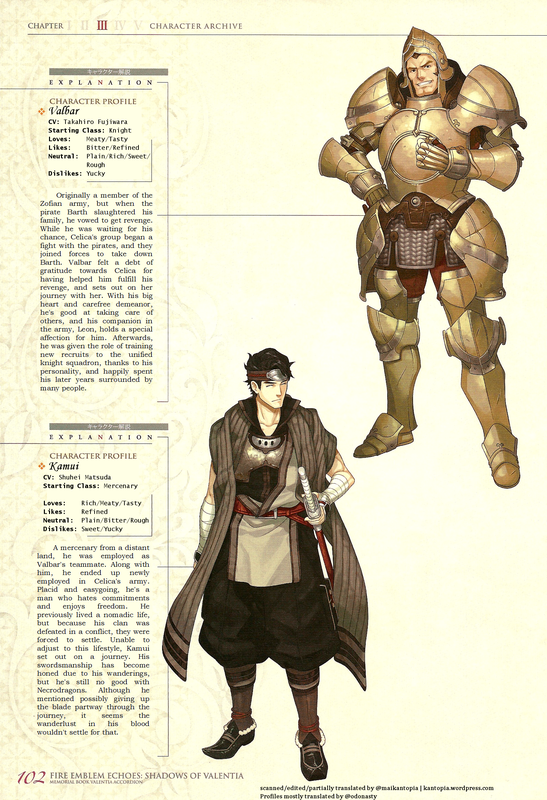 This entry was posted in Artbook, Fire Emblem, Shadows of Valentia, Translation, Valentia Accordion, Video Games and tagged backstory, character art, full portrait, kamui, profile, Shadows of Valentia, valbar. Bookmark the permalink.